"I would like to share here my experience of an African hunting safari on Uitspan Ranch in the Kalahari Desert of Namibia. 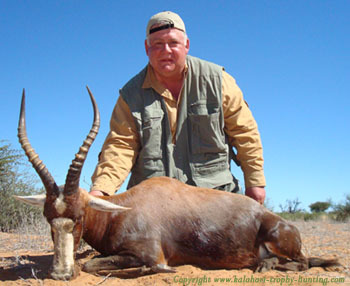 I hunted with Uitspan Hunting Safaris during May, 2009. 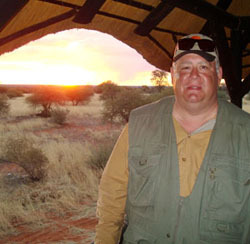 In August of 2007 I had hunted plains game in Northern Namibia. I was very successful and had enjoyed myself. After my first African Safari I knew that I wanted to return to Africa. 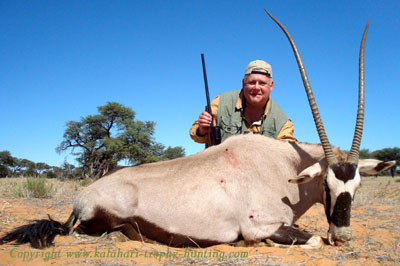 This time I wanted to hunt an Eland with my Ruger African .375 Ruger. The Eland is the largest of the antelopes in Africa and it's spiral horns make a wonderful trophy. In February of 2008 I happened to be surfing the web and found a marvelous website for Uitspan Hunting Ranch. I called the international number on the website and contacted Michael Duvenhage. Michael is the Professional Hunter at Uitspan Ranch. Michael's wife Tienie, father Hendrik and mother Isabella, run the ranch which is loaded with plains game. They also raise sheep. I was very excited to talk to Michael from such a far distance. He assured me that Uitspan had good quality trophy Eland bulls. Michael said I could use my .300 Win Mag for Eland. He said it had plenty of firepower for the Eland. 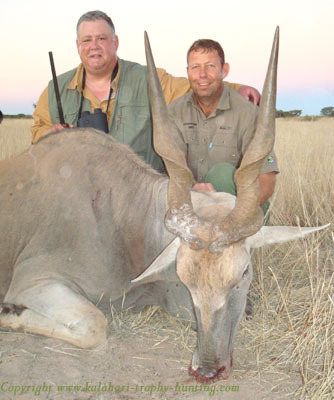 He also said that they have several Gemsbok that are over 40 inches. I was eager to book a hunt for May of 2009. Michael said the Kalahari Desert would be lush and green at that time of year. For over a year I corresponded with Michael and Tienie by e-mail. I submitted African hunting stories to their contest. Unfortunately, I did not win the writing contest but had great fun submitting each story and reading the comments that the stories generated. I also read the Kalahari Hunting News that they send out every two months. I especially liked the photos, the humor and the scripture that were included in every Newsletter. The Duvenhage's eleven year old daughter, Maria, contributed interesting facts about the Kalahari to the Newsletter also. In my year of correspondence I started to feel like I was a close friend to the Duvenhage family. May 2009 finally arrived. I flew South African Airlines over the big pond and landed in Jo-berg. I stayed at the African Tribes B&B for the night. In the morning I flew to Windhoek, the capital of Namibia. The Duvenhages met me at the airport. It was very exciting seeing these friends after a year of correspondence and seeing their pictures on the website. I was greeted warmly. I was overjoyed at meeting them. After greetings we put my luggage and firearms into their Toyota Landcruiser. We were off to the Kalahari! While driving to Aranos, the nearest town to Uitspan, I experienced the landscapes of central Namibia. The land was quite dry but there was plenty of trees and grass. Namibia had received record rainfalls this year and the Acacia trees were loaded with seed pods. These seed pods are eaten by the Kudu and the Eland and are packed with nutrients. This year the animals were fat and healthy. The road was well maintained gravel. Tienie gave me some Fanta to drink and some Kudu sausage to eat. We almost ran over a snake on the gravel road. Michael stopped and we got close to the snake. It was a Puff adder, which account for the most deaths per year in Africa from poisonous snakes. Puff adders are very prolific and can give birth to 80 young snakes at a time. This was the first poisonous snake that I ever saw in the wild, anywhere. Aranos is a small town and here the Kalahari really begins. There are red sand dunes and Acacia trees. Tall golden grass covers the dunes. Every Acacia tree appears to be full of nutritious seed pods. We drove to Uitspan and went to the hunting camp, about 450 yards from the Botswana border. We unloaded our stuff and I was shown to a luxurious thatched building where I would sleep for the next six days. The thatched building had running water, a toilet and shower. The camp is powered by solar cells, so there is light available at night also. In my 2007 safari, the camp in northern Namibia had a generator and we needed flashlights at night. I was immediately offered a cold glass of borehole water. The borehole goes down 300 meters into the sands of the Kalahari. The water tasted wonderful and quenched my thirst. Michael suggested that we go to the pan and see if my rifle was sighted in. The pan is a large flat area that has water during the rainy season. Now the pan serves as an airfield for small planes and a rifle range. When we arrived at the pan Michael immediately spotted some Kalahari Gemsbok and a herd of Eland. At 1500 yards, the Gemsbok ran into the hills su rrounding the Pan. The Eland remained. Michael and I attempted a stalk of the Eland herd in the gathering twilight. Michael said a large blue colored Eland bull was in the herd. We got to within 200 yards of the bull; then he disappeared into the brush. Michael said we could sight in the rifle tomorrow morning. That night I met Hendrik Sr. and Michael's brother in law, Neil. 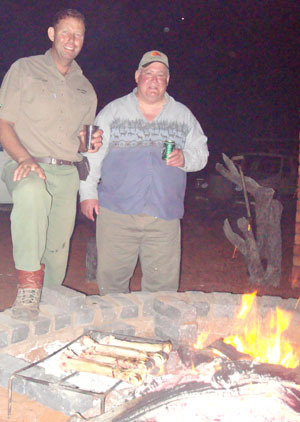 We had a fine supper of Kudu steaks and drank Windhoek Lager around the splendidly large fire pit. We sang songs, including The Old Kalahari and enjoyed each other's company. I was made to feel very comfortable. When it was my turn to sing a song, my mind went blank. Then, Tienie started to sing Home on the Range. We all joined in. Every effort was made to make me feel at ease. The next morning I had biscuit, tea, and cream and then Michael and I met with Hendrik and Neil. Neil would videotape my hunt and Hendrik would locate the animals. We started out looking for Eland but quickly ran into a large herd of Gemsbok. We followed the Gemsbok for many miles. There were three exceptional animals in the herd with horns over 40 inches. It was difficult to get an isolated shot at an individual animal in the large herd. Finally I got into position to take a shot at one of the isolated 40 inchers. I made a good shot in the lungs. The Gemsbok faltered and we followed it a ways until I could put in a finishing shot. I was overjoyed. Hendrik used his hands to measure to Gemsbok and he said it was a very good animal. Michael measured the Gemsbok and it was a Rowland Ward 40.5 inches. A beautiful animal! That night we celebrated with Gemsbok steaks and Windhoek beer, sang songs and sat in warm comfort around the huge fire pit. Hendrik's wife, Isabelle, joined us with some wonderful food creations of her own. The next morning I was again awakened by the rooster! I had biscuits and tea and was ready to hunt Eland. Hendrik called and said he had seen a large Eland Bull. Michael and I and Neil joined Hendrik in tracking the Eland over the red sands of the Kalahari. We followed the Eland for miles. These large, 2000 pound animals can run all day. We saw Gemsbok, Kudu, Giraffe and smaller Eland during our pursuit of the big bull. We came to a wide expanse of grass near the Botswana border. The large bull Eland came out of the Acacia trees to my right at a gallop. I tried a running shot and hit the bull. He slowed down and I put the finishing shot into him. He was a magnificent specimen. His horns were a Rowland Ward 39.5 inches with an overall score of 265 cm. 210 cm is a NAPHA gold medal measurement so this was an exceptional animal - perhaps one of the 20 best from Namibia. We took many photos. It took the best efforts of everyone, including the two trackers, to get the Eland in the back of the truck. It was a huge animal! That night Tienie and Michael roasted the marrow bones from the Eland, cracked them, and stuffed a marrow and garlic mixture into the Eland tenderloins. The tenderloins were then roasted on the open fire. Any African hunter would surely relish such food. I certainly did. Tienie said the marrow from animals is best when there is a full moon. I told her I was a Biologist and could not think of how this could be so. However, she was correct, the marrow was excellent! The next morning we hunted Burchell's and Namaqua Sand Grouse. I had a Mossberg .28 ga over-and-under shotgun. I made quite a few shots as the Sand Grouse flew low over the waterhole. Michael used his Russian made side-by-side coach gun. The coach gun had a full choke .12 ga barrel and a .45-70 rifled barrel. Michael uses this gun as his back-up gun for Leopard. The gun did well on Sand Grouse also; Michael hit three Grouse with one shot. They say that you can set your watch in Namibia by the Sand Grouse. At 0800 they come out of the sky in flocks to the water. At 0900 they are gone. It happened precisely like that. 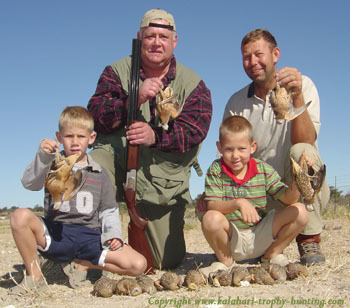 We harvested about 20 Sand Grouse, two of which were Namaqua. The Namaqua flew faster and cried "choc-co-lot" as they flew. 20 Grouse were enough for a supper. I had brought Wild Rice from Minnesota and planned on making a Wild Rice Dressing for the Grouse. Later that morning Michael, Neil, and I went Blesbok hunting. There was a large ram that had been kicked out of the main herd by more aggressive breeding rams. Michael said this ram had very long horns. We spotted the ram and two lesser rams and attempted a stalk. We climbed over a hill and got close, but the Blesbok were very wary. They ran off in the red sand. We followed them for about a mile. We got to within 200 yards and I tried a shot. My shot missed and we again followed the Blesbok. They stopped again about 200 yards away and I put my rifle on a tree limb for a rest. The tree limb broke and my rifle barrel buried itself into the sand. There was nothing else to do but go back to camp and clean my rifle. We cleaned the rifle, had lunch and headed back to where we had last spotted the Blesbok. During the afternoon we could not get close to the wary animals. They were kind of spooked. We decided to quit for the day when the full moon came out over Botswana and the sun became red on the horizon. That evening we went varmint hunting. I shot a Cape Fox, a Bat-Eared Fox and a couple of Springhares. I used Michael's coach gun. I was looking for a Genet Cat but we did not see one. It was an interesting hunt for these unusual animals. The next morning we went Blesbok hunting again. This time we tracked the Blesbok for about an hour. Finally, Neil spotted the Blesbok standing still in some tall grass. They probably thought that we could not see them. I put my scope on the large ram at 160 yards and made a shot. The Blesbok dropped. I was overjoyed and much relieved. There had been a lot of tension pursuing the Blesbok. I wondered if I could make the shot. We measured the Blesbok and he was a Rowland Ward 16.5 inches. A magnificent trophy! We took many photos. We loaded up the Blesbok and started to travel back to camp. We spotted an African Wild Cat in the long grass. The Wild Cat went down an Aardvark hole. I was told to stand over the hole with a .12 ga shotgun. Meanwhile a call was sent to Tienie to bring the dogs. Tienie came with a Greyhound named Meerkat and a Border Collie. The Collie went into the Aardvark hole but only succeeded in getting his nose scratched and bitten from the fierce little cat. Michael took a shovel and started to dig into the back of the hole. The cat jumped out and in a flash was on the run with the dogs following in hot pursuit. Michael had a look of joy on his face. The chase was on! We followed the cat until he made it to a large tree. The cat climbed the tree to get away from the dogs. I took the .12 ga shotgun and shot once at the cat. The cat dropped and Neil retrieved it from the dogs. It was an exciting hunt for a unique trophy! That night we had a delicious Blesbok Stroganoff cooked by Tienie. I was eating well of wonderful food but not gaining any weight. The next day was Sunday; no hunting on Sunday. We listened to a sermon over the internet and said some prayers. I also studied my Afrikaans. Michael said that if I could learn 100 Afrikaans words that he would give me a free animal. I used Isabelle's dictionary and Maria helped me a lot in pronouncing the words. I also helped Tienie clean the Sand Grouse. I cleaned their giblets and hearts and cut off their little crops which were full of seeds. I also cooked my Wild Rice dressing on Tienie's stove. That night we were to have dinner at Hendrik's house. We brought the food to Hendrik's house and had a great meal which included a large fresh salad from Isabelle's garden and corn on the cob from the tracker, David's, corn patch. During the meal I was quizzed on my Afrikaans. I said 'Lekker, baie lekker' and 'Dankie, baie dankie'. I said 'Mach whoops die hech' and 'da hgrasss is hgruuen and hgeel' Much laughter ensued after some of my pronounciations, but it was all in good fun. I had a wonderful time that evening. The next morning Michael and I left the camp on foot and attempted to shoot an Impala. We saw Steenbok and Kudu in the cool of the morning. Many fresh tracks were evident in the damp red sand. For three nights it had rained in the Kalahari which is very rare in the month of May. I spotted a large Impala and we followed it for about one half mile. All of a sudden we spotted a Springbok ram about 100 yards away. I made a quartering shot. We followed the ram's tracks in the sand and finally came close for the killing shot. We got a beautiful picture of the pronk. Michael said that I should cherish this Springbok because I had stalked him all the way. A great way to start out a morning. That afternoon we joined Hendrik in pursuit of a large Impala. Impala are sort of like White-tailed Deer in North America. They are about the same size as a deer and tend to hide in the brush. 100-150 yard shots are common. We found a magnificent Impala ram and I took a shot. It was a quartering shot and it was good, but the Impala is a tough animal. We tracked the ram for about one quarter of a mile. I put in the finishing shot. 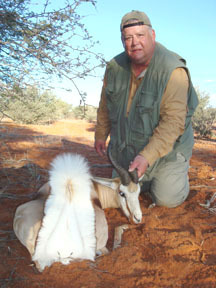 The Impala ram measured 24 inches; good enough for a NAPHA gold medal. The ram had a sleek skin and I decided I wanted the skin as a trophy. That night Michael made Karakul Sheep tjops on his braai and Tienie made braai brood with homemade Guava jam. The braai brood was a yeasted bread that was grilled over the Camelthorn coals with the mutton. The braai brood was yeasty and flavorful with the taste of the coals. The mutton steaks were tender. 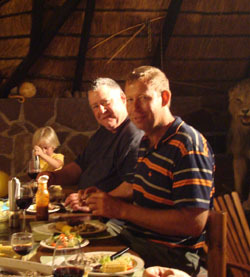 You have not lived until you have partaken of this wonderful meal in the Kalahari!! Michael and I did the paperwork for my hunt. I found out that I had some extra money in my account. This money, with the bonus that I had earned by learning Afrikaans, gave me enough to hunt a Black Wildebeest. Michael said he knew of an old Black Wildebeest that had been forced out of the breeding herd. I was delighted to hear of such an animal. I could hunt it in the old German Hunting tradition. German hunters always shoot the oldest animal, the most venerable animal and an animal that has passed on its genes into the herd over the years. German Hunting traditions are carried on in Namibia with the Conservation Medal given by NAPHA for an old animal past it's prime but of outstanding character. NAPHA also offers the Field Medal which is for a Gold Medal animal of extreme age; the ultimate prize in Namibia. In the morning we found the tracks of the Black Wildebeest in the damp red sand. Michael looked low under the Acacia tree canopies and spotted the Bull Wildebeest. Normally these animals are quite curious but this bull took off at a full gallop. We followed the Wildebeest on foot. We hiked for perhaps a mile. The Wildebeest turned right; in the direction of a water hole. Michael cut across the bull's tracks and we attempted to intercept him on his way to water. About one half mile further, after carefully walking through the soft sand and on the lookout for Puff Adders, we spotted the Wildebeest bedded down under a large tree. At our approach, the bull stood up and started to walk slowly towards us. Michael said I could shoot if I got a shot. I put up the sticks and got the Wildebeest in my scope. Michael pointed the video camera and recorded the action. At about 180 yards I made a frontal shot. WHAMMM!! The bull dropped in his tracks. Michael said his ears were ringing. It was a wonderful trophy; a NAPHA gold medal; probably a NAPHA field medal. It was an aged bull past his prime but still of outstanding character in the old German Hunting tradition. I was overjoyed at my trophy. 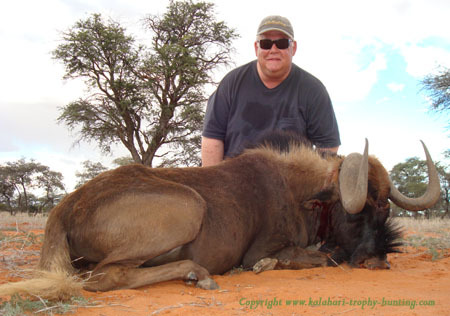 The Black Wildebeest was the cherry-on-the-cake of all the fine trophies that I had harvested at Uitspan. That night, Tienie made a Duiker potjie. Michael had let me shoot a Duiker for meat. It turned out that the Duiker scored Namibian Silver, so it was a fine trophy as well as good meat. A potjie pot is a round cast iron utensil of varying sizes with long cast iron legs on the bottom. A fire is lit under the pot and the meat and vegetables within are simmered over the fire and coals. I can honestly say that this Duiker Poitje was some of the best meat that I have ever eaten. My safari on Uitspan Ranch was over. It had been an experience that I will always cherish. It could not have been better. Good companionship, excellent hunting, comfortable accommodations, superb cuisine, cold drinks from Namibia... all in the pristine setting of the Kalahari under wild African Skies. with visitors to this website.